'He's a gentle man who's totally confused at his situation at this point,' says Carlos Ortiz's court-appointed attorney. ATTLEBORO, Mass. — A man who faces a gun charge in the murder case against former New England Patriot tight end Aaron Hernandez agreed Tuesday to remain in jail until a hearing next month. Carlos Ortiz appeared Tuesday in Attleboro District Court, where a hearing to determine if he is a danger to the community was scheduled for Aug. 14. If Ortiz is determined to be dangerous, he can be held without bail for 90 days. Ortiz did not speak during the hearing, except to say “thank you” to the judge when it concluded. After the hearing, Ortiz’s court-appointed attorney, John Connors, said he plans to argue for bail but couldn’t do so without discovery documents, which he’s made a motion to obtain. Connors said his client knows Hernandez from their hometown of Bristol, Conn., but wouldn’t be specific about how they met, except to say that Ortiz was an athletic young man around the same age as Hernandez’s older brother. He described Ortiz, 27, as indigent, and said he was afraid and depressed, like anyone being held in jail would be. “He’s a gentle man who’s totally confused at his situation at this point,” Connors said. 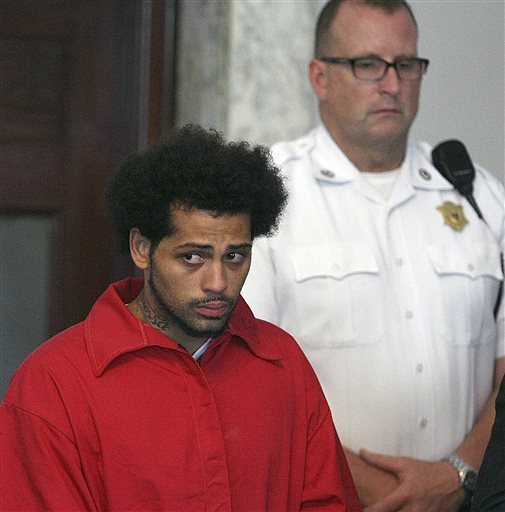 Hernandez is being held without bail after pleading not guilty to murder in the June 17 fatal shooting of Odin Lloyd, whose body was found in an industrial area near Hernandez’s North Attleborough home. His attorneys have said the evidence against him is circumstantial and that Hernandez is anxious to clear his name. Ortiz was arraigned last month on a charge of illegally carrying a firearm on the day of the shooting. A not guilty plea was entered on his behalf. Prosecutors say Ortiz and another man, Ernest Wallace, were with Hernandez when Lloyd was killed, but they haven’t said who filed the fatal shots. Authorities say Hernandez orchestrated the killing because he was upset at Lloyd for talking to certain people at a nightclub a few days earlier. Also Tuesday, a judge is expected to unseal search warrants in the case, which could provide more detail about the murder investigation. News organizations sought access to the documents, and a judge agreed Monday to release the material by 2 p.m. Tuesday if there is no challenge by prosecutors and defense attorneys. Bristol County District Attorney Samuel Sutter said he won’t try to stop the documents’ release. It wasn’t immediately clear if defense attorneys would. Messages were left with one of Hernandez’s attorneys and a spokesman for his legal team. Wallace, who is facing an accessory to murder charge, pleaded not guilty Monday in the same court. The 41-year-old Miramar, Fla., man will be held without bail until another hearing on July 22, under an agreement between his attorney and prosecutors. Details of the charge against Wallace — accessory to murder after the fact — were not released during the brief proceeding. Sutter, the district attorney, declined to comment on the specific allegations outside the courthouse, citing the ongoing investigation. Lloyd, a semi-pro football player, was dating the sister of Hernandez’s fiancee and the two men were friends, according to Lloyd’s relatives. On Monday, Patriots owner Robert Kraft said that if the charges against Hernandez are true, his organization had been “duped.” The Patriots last year signed Hernandez to a five-year contract worth $40 million but released him the day of his arrest. Kraft also said the Patriots will “be looking at our procedures and auditing how we do things” with regard to character reviews.